HDL cholesterol may lose its protective effect during menopause. 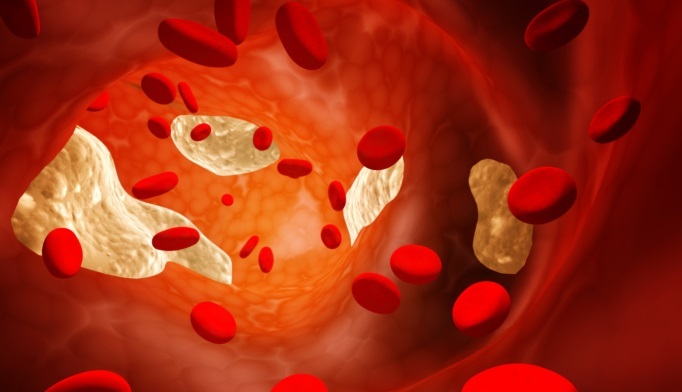 New data indicate that increased HDL cholesterol — commonly referred to as “good cholesterol” — may be associated with greater plaque buildup in the arteries during menopause. The benefits of HDL cholesterol in protecting against atherosclerosis are well documented, but researchers recently suggested that hormonal changes that occur during the menopausal transition, such as estradiol reduction, may diminish this protective effect. Samar El Khoudary, PhD, MPH, assistant professor in the department of epidemiology at the University of Pittsburgh’s Graduate School of Public Health, and colleagues sought to determine how changes during menopause affect HDL and its cardioprotective effects. They presented their results at the North American Menopause Society (NAMS) 2015 Annual Meeting. A total of 225 women (mean age at baseline, 45 years) who participated in the Study of Women’s Health Across the Nation (SWAN) who had up to five measures of carotid intima-media thickness (cIMT) over 9 years of follow-up were included in the study. All were free of cardiovascular disease (CVD) at baseline. After adjustment for age at baseline, time since final menstrual period, race, and education, results showed a significant association between higher baseline HDL and slower progression of cIMT (–0.22 mm per year per 1 standard deviation [SD; 11.80 mg/dL] increase in HDL cholesterol from baseline; P=.02). In contrast, a larger increase in HDL cholesterol from baseline was significantly associated with faster progression of cIMT (0.002 mm per year per 1 SD [6.06 mg/dL] increase in HDL since baseline; P=.009). The association between HDL cholesterol and cIMT progression was weakened after further adjustment for systolic blood pressure, BMI, LDL cholesterol, menopausal status and use of CVD medication (P=.09). However, the association between change in HDL cholesterol from baseline and progression of cIMT remained significant (P=.009). “What we found is that, as women transition through menopause, increases in good cholesterol were actually associated with greater plaque buildup,” Dr El Khoudary said in a press release. More research is needed to understand how menopause may affect all lipids, according to Wulf Utian, MD, PhD, DSC, who is executive director of NAMS. El Khoudary SR, Wang L, Brooks M, Thurston RC, Matthew A. Abstract S-18. Increases in High-Density Lipoprotein-Cholesterol Levels are Associated with Greater Intima-Media Thickness Progression over the Menopausal Transition. Presented at: North American Menopause Society (NAMS) 2015 Annual Meeting; Sept. 30-Oct. 3, 2015; Las Vegas, Nevada.